Creamy, flavorful, and packed full of healthy fats – this creamy avocado lime dressing is perfect for your next salad. SPRING IS FINALLY HERE. Isn’t it? I dunno. Michigan doesn’t know, that’s for sure. Yesterday Ben took out the trash and remarked that it felt “like winter.” Today as I write this, the sun is shining brightly, so you won’t hear complaints from me. My kids are just dyinnnnnng to be outside every second of the day and I try to comply with those requests as much as possible (I want to be out, too!). But they get so confused when they can’t wear shorts and sandals – Mr. Sun is a deceiving guy. I’m talking about warmer weather, again, mostly because I’m oh-so-ready for it, but also because this recipe screams summer to me. 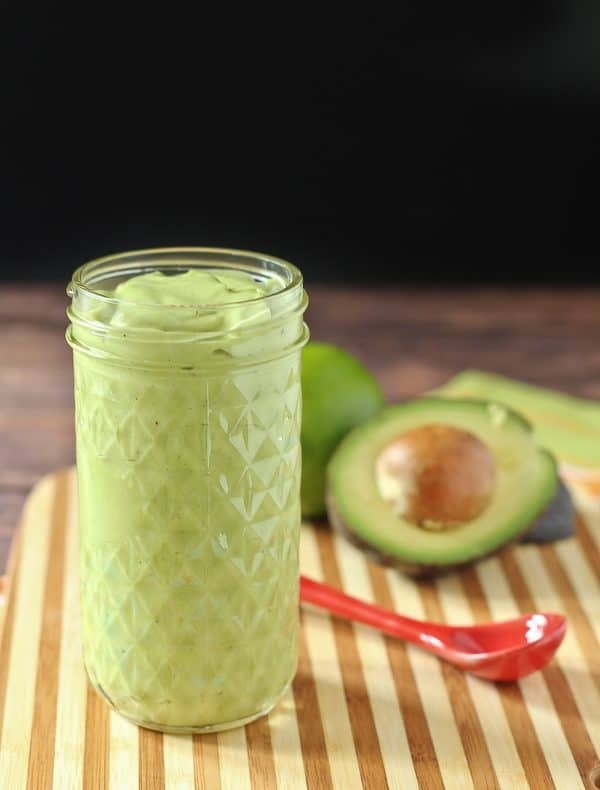 It takes five minutes to make so you’ll be out of the kitchen fast, it uses healthy fats (avocado) for great creaminess so I’ll you’ll look great in your bikini, and it’s such a bright green cheerful color! I’ll be sharing a filling salad tomorrow that uses this dressing so make sure to check back for that! UPDATE: It’s this quinoa salad with avocado dressing – a must-try! This one is for all you cilantro-haters out there. I’m clearly a cilantro lover, but I know many of you are not. And when I did a quick search for creamy avocado lime dressings, many (if not all!) contained cilantro. Instead of leaving it out completely, I wanted to replace it with another powerhouse flavor. It just so happens to be one of my favorites – cumin. 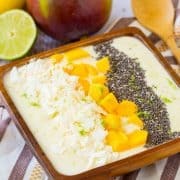 It gives this dressing a nice warm flavor that contrasts perfectly with the bright citrus of the lime. 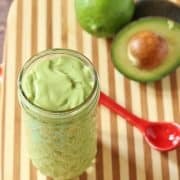 It gives this avocado lime dressing that little extra something that will have you coming back for more. 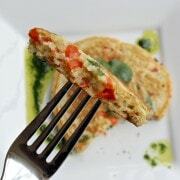 It’s made in minutes using a blender or a food processor. It’s super versatile, and you could even spread it on a sandwich. Make sure to try it on this quinoa salad with pinto beans and red bell peppers. Blend all ingredients together in a blender or a mini food processor until smooth. Taste and season as desired. If you want it to be thinner, add a bit more water. Use immediately or store refrigerated in an airtight container. Verdict: You guys already know I loved it. I don’t share recipes if I don’t love ’em! Husband’s take: He loves this dressing – maybe even more than I do! Do you think this would be okay to freeze? I haven’t tried freezing this dressing, but I think it would work well. The texture might change slightly, but it should be okay. Loved this recipe!! The cumin adds a nice kick. Will be making this a lot in the future! So glad you liked this recipe! Thanks for taking the time to come back and leave a comment! Love the addition of cilantro! So happy you like this – thanks for taking the time to come back and leave a comment! Quinoa salad too! Very good on that as well! 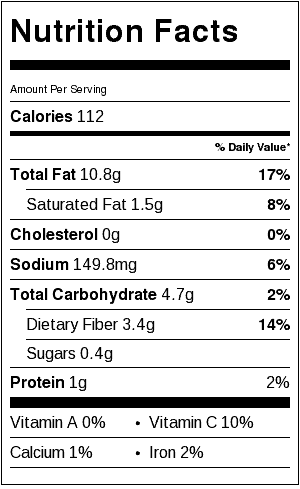 It is really good on quinoa salad too! This is SO good! 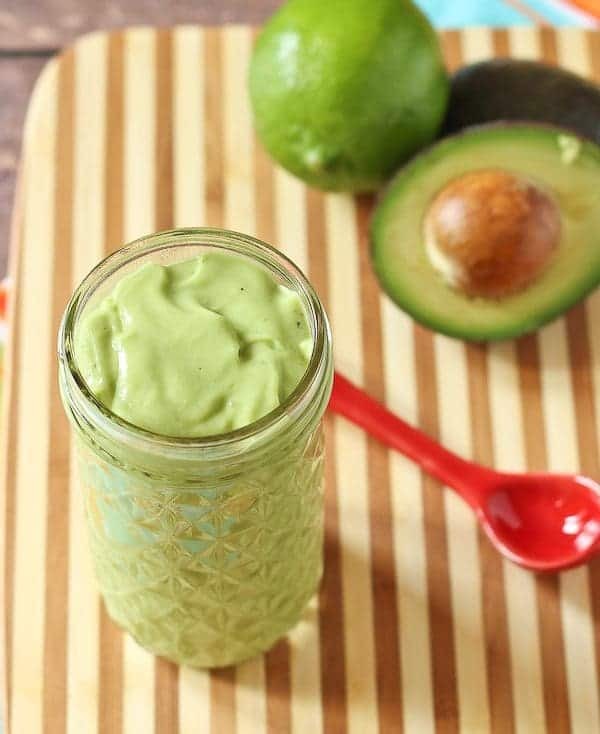 If you love avocados I definitely recommend making this. I’m well familiar with having a mountain of rejects to go through while trying to perfect a recipe — currently going through a lot of a very special vanilla cake phase. This was excellent. I just need another recipe to use the leftover half cup of the dressing. Any ideas? Ooooh it would be great on tacos or nachos! Wonderful and simple to make. . I love the added cumin. i use a small fresh garlic clove in place of the powdered. 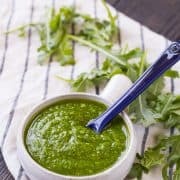 I’ve made this dressing many times and people love it. Cilantro compliments the flavors. Thanks you. I’m so glad you liked this recipe, thanks for taking the time to comment! I love cilantro, too! Can i keep the olive oil out? You may substitute the olive oil with a different oil or leave it out completely, but it will change the taste and consistency. Made this tonight! I was looking for a recipe without cilantro because I don’t have any right now. This is delicious! So happy you liked it! The cumin adds so much great flavor. Any idea how long this will keep in the refrigerator? I know I will love it but my husband may or may not. It’ll take me a while to finish it by myself! I would say 2-3 days probably, it disappears quickly in my house! You could easily cut the batch in half too. Thanks Medha! I’m a cumin lover too.